Each title in this trilogy stands alone; each contains the sweet romance of one couple. The main characters in book 1 (“Doc Joe” and Naomi) are secondary characters in books 2 and 3, and the main characters in book 2 (Chadwick and Sophia) are secondary characters in book 3. All three stories conclude with a happily-ever-after (absolutely no cliffhangers!). I enjoyed including the married couples in later stories, and sincerely hope you’ll enjoy catching up with them as you discover Henry and Isabella’s love story in book 3. All three novellas in this trilogy are unified by place, as they’re all set in Evanston, Wyoming, just before Wyoming Territory achieves statehood in 1890. Evanston is a real place! I enjoyed setting three stories there, as it’s not far from where I live, and I traveled there many times while a Territory Manager for Weight Watchers. Memories of BAKING summertime heat and the deepest of wintertime FREEZES are etched in my memory. The three novellas are also unified by theme–specifically, the theme of “over-educated women“, at least by late Victorian-era standards. All three leading ladies stepped out of the expected mold (wives, homemakers, and mothers!) society (and their families) intended for them, and each came to Evanston (for varying reasons) as professional women. One doctor. One lawyer. One dentist. Each career choice cost each heroine a good deal. Each faced conflict true to history, much like the first women in each field did. I enjoyed bringing each couple together in a way that seemed natural, given their personalities and motivations. By book 3, Isabella had far more support from friends who understood her predicaments than did Naomi in book 1 (but her hero was supportive in many good ways). I’ve published numerous blog articles about the historical details surrounding each story. You’ll find links to those articles on the individual book titles’ pages on this site. Please click on the titles (links), below, to explore the additional information I shared. I hope you’ll find interesting and informative historical tidbits that will enrich the fiction set against that historically accurate backdrop. Click on the title (link) for much more information on individual titles. Book 1: WANTED: Midwife Bride (Contained within Mail Order Bride Collection: A Timeless Romance Collection) ~ A USA Today Bestselling Title! Book 2: Sophia’s Leap-Year Courtship (Timeless Romance Single, Book 2) ~ A RONE Awards 2018 Finalist! Book 3: Isabella’s Calico Groom (Contained within Calico Ball: Timeless Western Collection, Book 1) ~ Publication Date: July 10, 2018! Available for pre-order. By definition, a trilogy contains three books. With the publication of Calico Ball in July, 2018, the trilogy is complete. Does that mean I’m done bringing professional women to Evanston, and introducing them to romance with the one man who will, eventually, become the one she doesn’t want to live without? Maybe. I do have many other books and ideas vying for my attention. And maybe not. 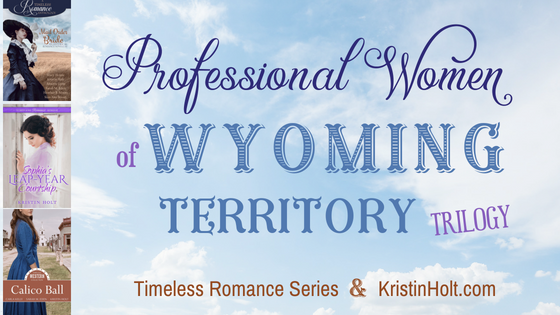 The Professional Women of Wyoming Territory Trilogy could very easily become the Professional Women of Wyoming Territory Series.